Kua chap is a unique instant soup, as the noodles are in a circular shape (like macaroni) and the flavor is mild. Lovely aroma and a distinct elegant spice from white pepper. A very soothing soup alone, and you can dress it up by adding hard-boiled egg, meat, vegetables, etc. Inside each package is kua chap noodles, and three packets as shown below. See our recipe for kua chap made from scratch. Ingredients: rice flour, salt, sugar, flavor enhancer (E621, E627, E631), pepper. Product of Thailand. 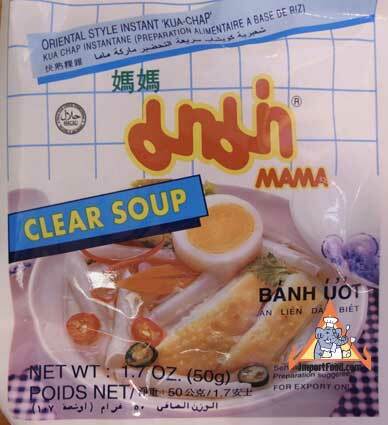 Please consider similar clear soup also.